If you have an Astwood agent in your area your details will be passed on to them and they will contact you with a quote and any other information you need. We only deal direct with customers for garden log cabins in areas where there are no agents and in exceptional circumstances. We value the work our agents do and don’t want to undermine them. Once you have your quote and you are happy with the final specification of your log cabin you can place your order. 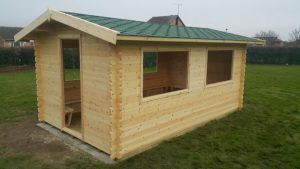 A 20% deposit is required with all garden log cabins orders. You will then be contacted with a delivery date. You must read through everything and check that your personal information, log cabin information and log cabin plans are all correct. You must notify us of any amendments within 7 days of the date on the letter. Before delivery you must also fill in and return the Delivery Sheet in the envelope provided. We will contact you the day before your log cabin is delivered to give you an approximate arrival time. Payment of the balance is due prior to or on delivery.